The input data should be in the standard FASTA format with the substitutions specified in each sequence's header, delimited by spaces (no commas or semi-colons). The sequence ID can be of any format so long as it does not contain a space, a semi-colon or a comma. An example is provided below. In the first record, the header begins with a > followed by the sequence ID: NP_057295|SEC31A. There are three substitutions for this sequence: P changing to T at position 775, P changing to S at position 764, and P changing to Q at position 764. The web server allows for predictions on 100 amino acid substitutions (the number of sequences does not matter). Every protein sequence must be of length >30 and <30,000 residues. Note that computation time is proportional to the length of a sequence and the number of substitutions. The other information that the web server asks for are an email address and a P-value threshold. Results from MutPred2 will be sent via email to the address provided. 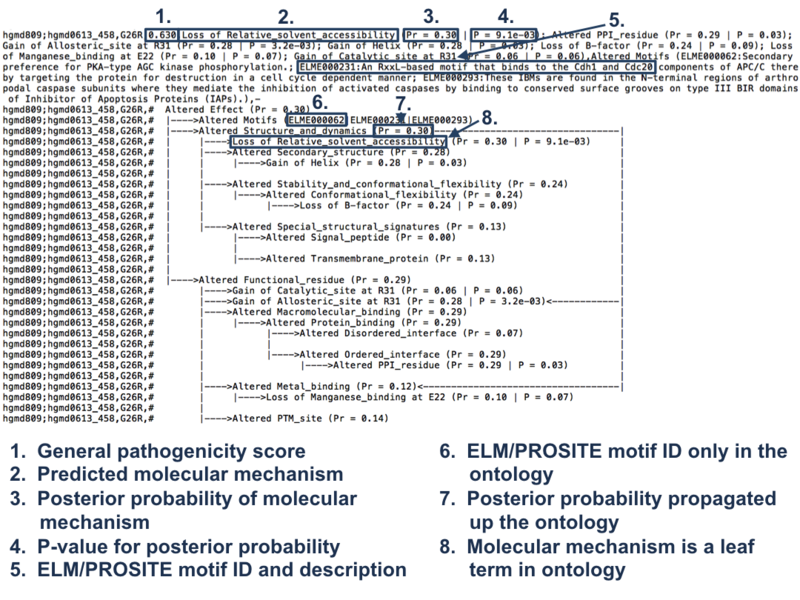 The P-value threshold determines the filtering criterion for displaying predicted molecular mechanisms (if set to a higher P-value, more mechanisms will be shown in the output). For more information on interpreting MutPred2 predictions, see below. 2. PSI-BLAST is provided along with MutPred2 and needs to be told where the BLOSUM62 matrix file is. If you already have a legacy version of BLAST installed, it will probably find the file on your machine. In that case, jump directly to step 3. Otherwise, open a file called .ncbirc in your home directory. If it does not exist, create one. Add/modify the following lines to point PSI-BLAST to the data sub-directory. 4. If need be, you can add the mutpred2.0 directory to your bash profile. For instructions, see here. Alternatively, if you have MATLAB-R2016b installed or the MCR (version 9.1) already available, you can just edit this line to point to the location of the MCR on your machine and delete this directory to save space. Note for experienced MATLAB users: if you already have been using MATLAB and have MATLAB_USE_USERWORK=1 in your .bashrc file, MutPred2 might run into some issues. To prevent any error messages due to this, unset this variable. Command-line arguments: all argument information can be displayed by simply typing run_mutpred2.sh without any command-line arguments. The output of MutPred2 consists of a general score (g), i.e., the probability that the amino acid substitution is pathogenic. This score is the average of the scores from all neural networks in MutPred2. If interpreted as a probability, a score threshold of 0.50 would suggest pathogenicity. However, in our evaluations, we have estimated that a threshold of 0.68 yields a false positive rate (fpr) of 10% and that of 0.80 yields an fpr of 5%. 1. The posterior probability of the loss/gain of certain structural and functional properties due to the substitution (Pr) is provided. Since these are true posterior probabilities, they can be compared across properties and serve as a means of ranking putatively impacted properties, i.e., the output of MutPred2 ranks molecular mechanisms in descending order of Pr. It is important to note that loss or gain should be interpreted as decreased or increased propensity for a certain property to occur in the region (-5 to +5 residues) of the substitution. In the case of certain properties, a single-residue change can result in effects in both directions, thus, complicating interpretation. For instance, a substitution can increase a protein’s propensity to bind one protein partner but decrease its propensity for another. For simplicity, the term altered is used for such properties (instead of loss or gain) and the maximum of the loss and gain score is reported. 2. An empirical P-value (P) calculated as the fraction of benign substitutions in MutPred2's training set with Pr values >= to the Pr value for the given substitution. A P-value threshold of 0.05 means that, under the null hypothesis, we expect 5% of benign substitutions to impact the particular property to the extent that the given substitution does. These P-values are specific to each property, and therefore, two properties with the same Pr need not have the same P-value. Assuming that the probability that a particular residue has a propensity for a certain property is 0.5 and that the substitution does not impact this propensity (the mutated residue also yields a probability of 0.5), the posterior probability of impact is 0.5 x (1 - 0.5) = 0.25. This serves as a reasonable operating threshold, above which the disruption of a property could be implicated as a molecular mechanism of pathogenicity. Even when scores are lower than this value, it is recommended to make follow-up decisions based on the ranking and the associated P-values. Differences between the outputs of the web server and the standalone versions: Unlike the standalone software's output file, the web server version displays molecular mechanisms only for the substitutions with g >= 0.5. The other major difference is that the web server output format ignores the ontology structure and only displays scores for the leaf terms as a ranked list.